Mountain View police are seeking a suspect in a smash-and-grab burglary in a Starbucks coffee shop parking lot on Monday. Police on Wednesday released video of the burglary, which occurred around 9:55 a.m. Monday in a Starbucks parking lot on Pear Avenue off of North Shoreline Boulevard, just down the road from the headquarters of Google and LinkedIn. 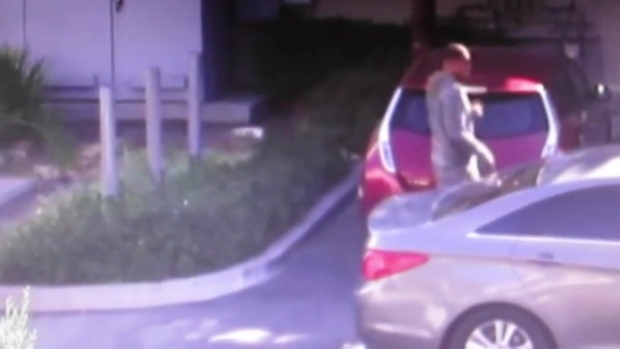 The suspect, a tall man in his early 20s who wore gray pants and a gray sweatshirt with white tennis shoes, can be seen in the video walking up to a red Nissan Leaf. Video shows a man in a Starbucks parking lot in Mountain View smashing a car window and taking a backpack. He then looks around and pulls his sleeve over his right hand and smashes the back windshield of the car and grabs a backpack, which police said contained a laptop. The suspect then walks over to a newer-model Hyundai Sonata that drove away. "This was obviously a crime of opportunity," said Katie Nelson, spokeswoman for the Mountain View Police Department. "We're not sure if they were following (the victim) or if they had been casing the parking lot already." Police said the victim had stopped for coffee and was gone for just a few minutes. His laptop computer was inside the stolen backpack. "We're looking into whether or not these gentlemen were involved in any other cases," Nelson said. A worker at a nearby Italian restaurant was stunned to see the theft happen in broad daylight. "It's incredible; it's crazy, especially during the day," said Howard Sandoval, a server at Cucina Venti. "You wouldn't expect something like that to happen, especially not in this area." Police are asking anyone who recognizes the man or car, or has any other information about the case, to call Officer Doerres at (650) 903-6344.